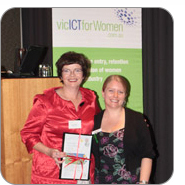 at the recent annual dinner for the Victorian ICT for Women our erin, creative director extraordinaire, was presented with an award recognising her significant contribution in supporting women working in ICT. this is fabulous recognition for erin who has mentored and supported many people in multimedia, filmmaking, training, the disability sector, and of course here at yum over the last 25 years. her business model has been one of providing a supportive partnership with clients to ensure they get what they need, understand what they need to do and apply the skills they learn when they develop a relationship with yum. erin will have a permanent plaque established at the Queen Victoria Women's Health Centre on their Shilling Wall to acknowledge her contribution to enriching the lives of other women. on behalf of us here at yum, congratulations erin! One Response to "shilling wall achievement award"